ATLANTA — The Packers will have to adjust on both sides of the ball due to an extensive injury list to starting players on Sunday in Atlanta. On offense, WRs Ty Montgomery (illness) and Randall Cobb (hamstring) are both out, while on defense, LB Clay Matthews (hamstring) is also out. Without Montgomery or Cobb, the Packers will be back to a more traditional backfield and running game, with newly acquired Knile Davis and former practice-squad member Don Jackson. Both players made their Green Bay debuts in limited action last week vs. Chicago. Jackson injured his hand and came out of the game, but he was able to function in practice this week with a wrap on his hand. Davis came to the Packers in a trade with Kansas City and has now had a week and a half to learn the playbook. At receiver, the absences of Montgomery and Cobb also will factor. Jordy Nelson is the most likely candidate to take Cobb’s place in the slot, but Jeff Janis could get some work there, too. On the outside, Davante Adams is coming off his best career game, but also look for more snaps for rookies Trevor Davis and Geronimo Allison. Signed from the practice squad this past week, Allison will be making his NFL debut. Matthews also out: As the injury situation goes from bad to worse, Matthews is also out for this game due to a hamstring injury. It’s the second game this year Matthews will miss due to the injury, having sat out in Week 3 vs. Detroit as well. With Matthews out, Nick Perry and Julius Peppers will likely start at the outside linebacker spots, backed up by Jayrone Elliott and rookie Kyler Fackrell. Around the NFC North: At the time of this posting, the Lions were trailing the Texans in Houston, as Detroit (4-3) is looking to win its fourth straight game. Should the Lions lose, the Packers would remain in second place in the division after today regardless of their result. If Detroit rallies to win, the Packers would drop a half-game behind them into third place with a loss. First-place Minnesota (5-1) is at Chicago on Monday night. The best-case scenario for Green Bay is a win coupled with a Vikings loss, which would create a tie at 5-2 atop the division. 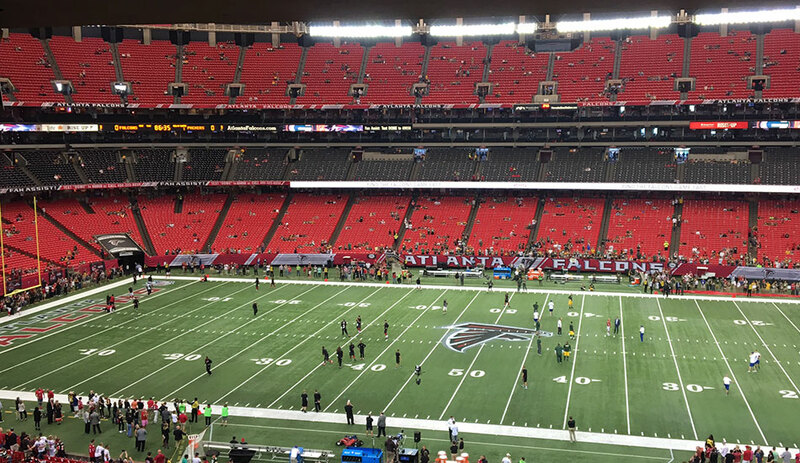 Long time no see: The Packers haven’t been to the Georgia Dome since 2011, and barring a playoff meeting in January, it’ll be their last trip here. Atlanta is building a new stadium right next door that is scheduled to open next year. Coming home: Veteran Packers safety Morgan Burnett is from Georgia and played his college football at Georgia Tech. He’ll have a bunch of family and friends in attendance today, but one who won’t be watching Burnett in person is his father, who passed away in the summer of 2015. For more on Burnett’s family history and how close he was to his dad, be sure to check out this story by Wes Hodkiewicz.